Fuel on the Ground – We really need to consider how dry we are, especially if you haven’t burned in a few years. If your managing timber alone and haven’t burned in a few years, you may have lots of rough build up on site. This can burn hot and scorcth trees. For these sites, it’ll be better to wait for a rain. 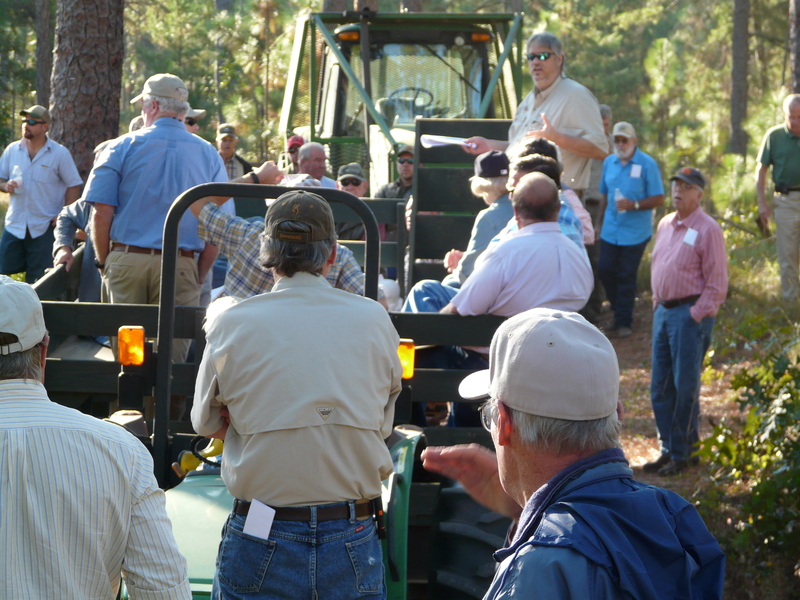 Dr. Moorhead looked at a stand in one county where 100% of the trees were scorched. If you’re managing for quail, and burn every year, you won’t have as much litter on the ground. We’re safer in this scenario. 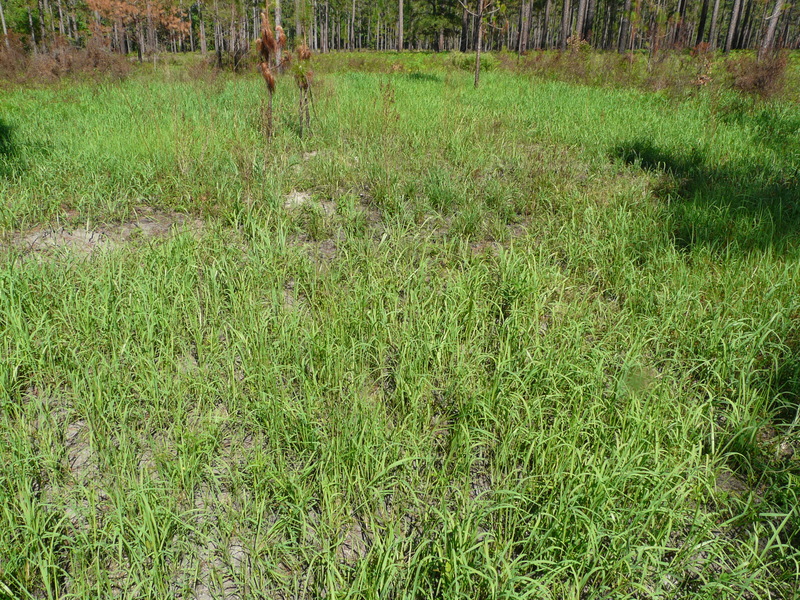 Natural Firebreaks – Check your natural firebreaks, like wetlands. Even these could be dry. I was with a farmer yesterday looking at corn, and he mentioned how many fields they’ve planted this year that normally would be too wet to plant right now. 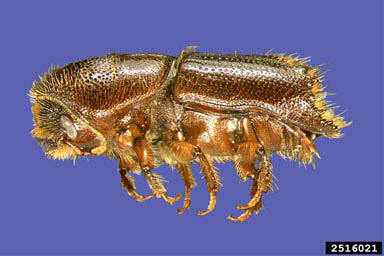 Ips Beetles – Our beetle attacks have been worse this season because of the drought last year. These trees are under stress already. If you have a CURRENT beetle attack, Dr. Moorhead recommends to not burn. This will further stress those trees. 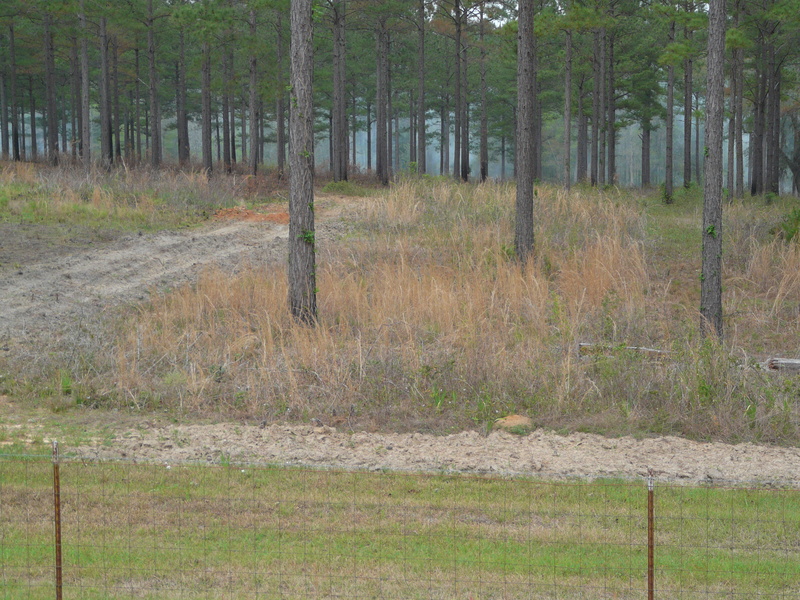 This can affect our larger stands on plantations where thousands of acres are involved. How do you know if the beetle attack is current? If you see a group of dead tress (3-10) with pitch tubes on the bark, you need to think hard about burning. It is true that once symptoms of the attack show up, the Ips beetles are gone. But, if you are on a large track of land, the beetles maybe right around the corner. For more on Ips Engraver Beetles, look at this former blog post. Worker Safety – When it is this hot and dry, worker safety is very important. Be careful not to get dehydrated. Working conditions will be hotter, and fires too may move fast. Burn Permits – Mostly certainly get your burn permit. 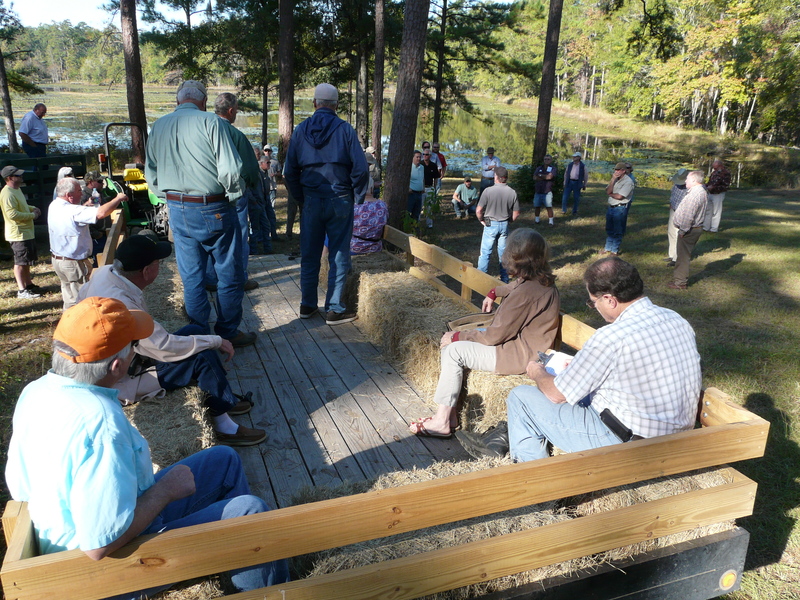 Also, talk with the Georgia Forestry Commission. They can help with analyzing current conditions and determining if burning is safe now. 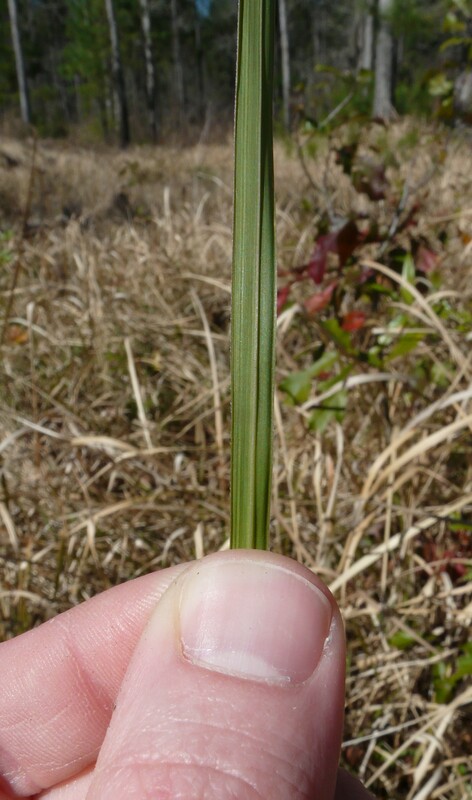 Golden bamboo (phyllostachys aurea) and other nonnative bamboos are perennial grass-like plants. These are runner types of bamboo, that spread with thick, underground stems called rhizomes. 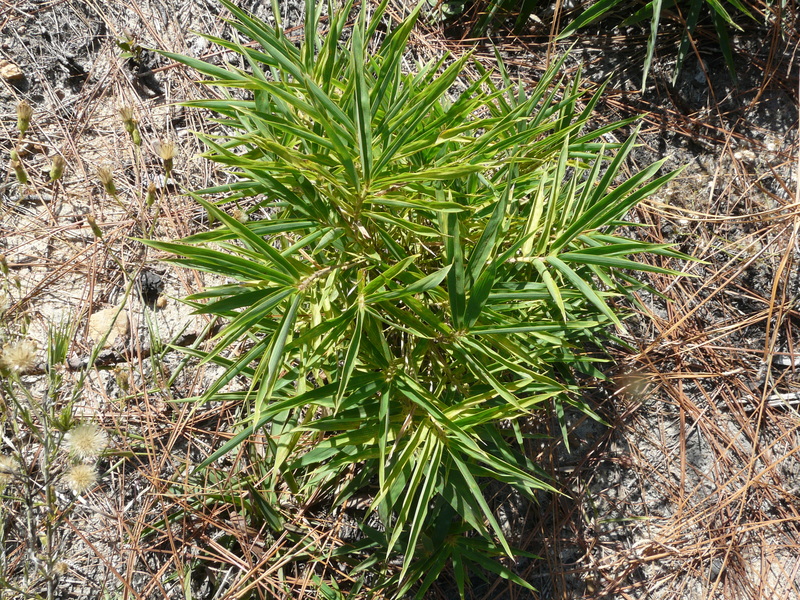 Clumping bamboo species grow in large clumps and are much slower in spreading. 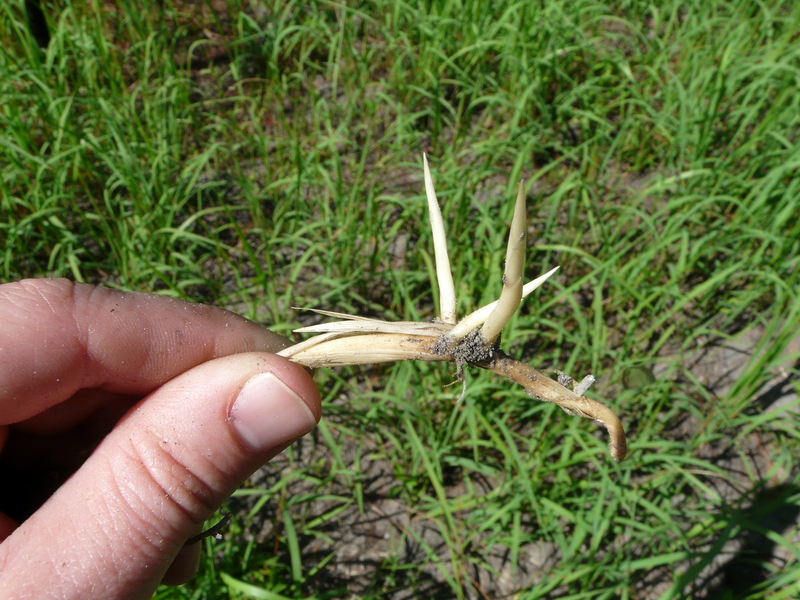 These rhizomes can spread more than 100 feet from the mother plant. We did not get a chance to stop by a site of bamboo at Pebble Hill for our Forestry & Wildlife meeting this year. But Dr. Moorhead did cover this topic during lunch. Here is a picture of the site we would have visited, and actually is probably 90% controlled. When controlling these runner-types of bamboo, there needs to be some efforts to break up those rhizomes. In open area patches, you can use a tractor and disk to knock down and chop up the rhizome mat. Following this, we’ll still need to use herbicides. Dr. Moorhead recommends a soil active herbicide. Velpar L or Velpar DF is a good choice. This is made in the spring of the year. Use a site prep rate which will kill any trees with roots growing in the treated area. 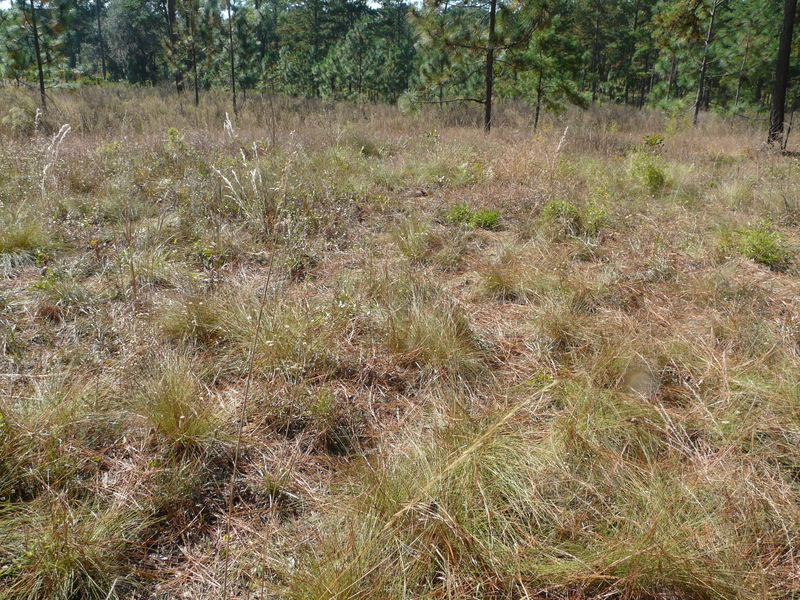 If pine are growing in the patch, use a release rate of Velpar noted on the herbicide label based on soil texture. If you cannot risk this kind of damage to the overstory trees, cut down the bamboo (crush it, burn, etc. ), then treat the new shoots with 4% glyphosate (1 pint per 3 gallon mix).. Here is an example of the rates of velpar from the UGA Pest Control Handbook. We need to be under “Coarse” texture on the far right: 2, 3 or 4 qt per acre for a release rate. With the persistence of this drought, we may see more bark beetle attacks. For the first time, I witnessed two Ips engraver attacks on the same property. The two attacks occurred four weeks apart. The scenario required for Ips attacks is not usually reoccurring. Because they attack only stressed trees, Ips usually leave the scene and are done. Could it be that stress from the drought is causing trees to release the stress pheromones that attracts the beetles? There are a few species of beetles that cause problems in pine stands. The Southern Pine Beetle and Ips Engraver Beetle bore into trees and induce the blue stain fungus. This fungus clogs the vascular tissue of the tree and kills it. The difference in the two species is that Ips beetles rarely if ever attack a healthy tree. Pheromones (chemical signals) from a dying or distressed tree are picked up by Ips beetles. These are usually lightening struck trees. Once Ips beetles show up, they only attack a few trees and leave. Sometimes I see 3 trees in a stand killed and as many as 8 trees killed last week. 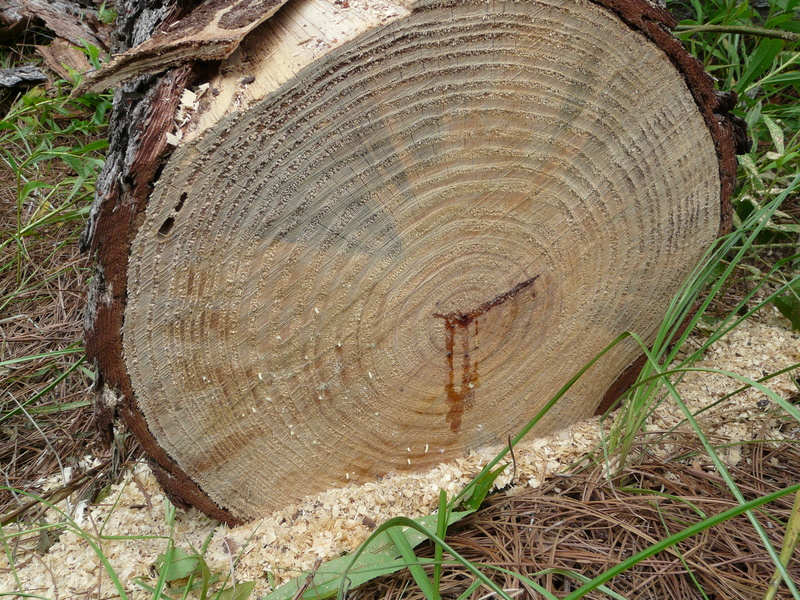 Other than a tree that suddenly dies, the most common sign of an Ips attack is pitch tubes on the side of the tree. 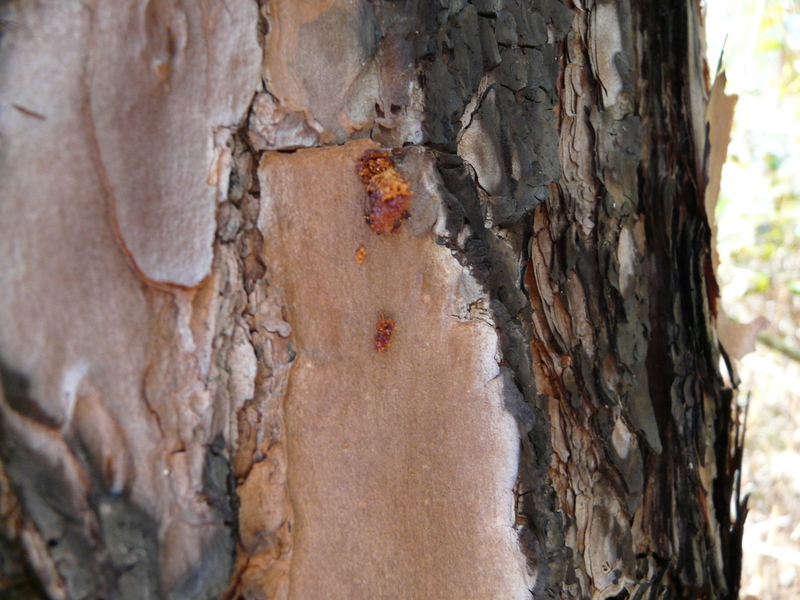 Once the adult beetle bore into the tree, the tree exudes sap to counter the beetle. 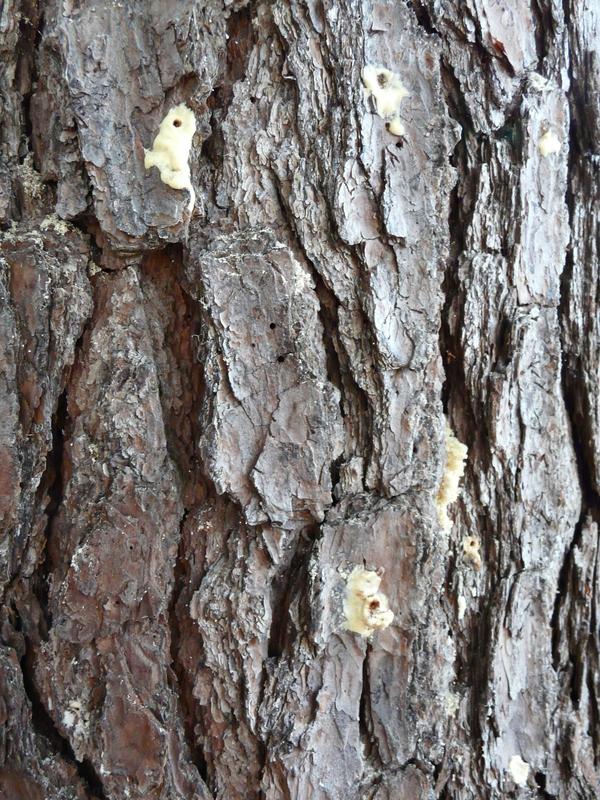 The sap piles up and look like pieces of bubble gum attached to the tree. 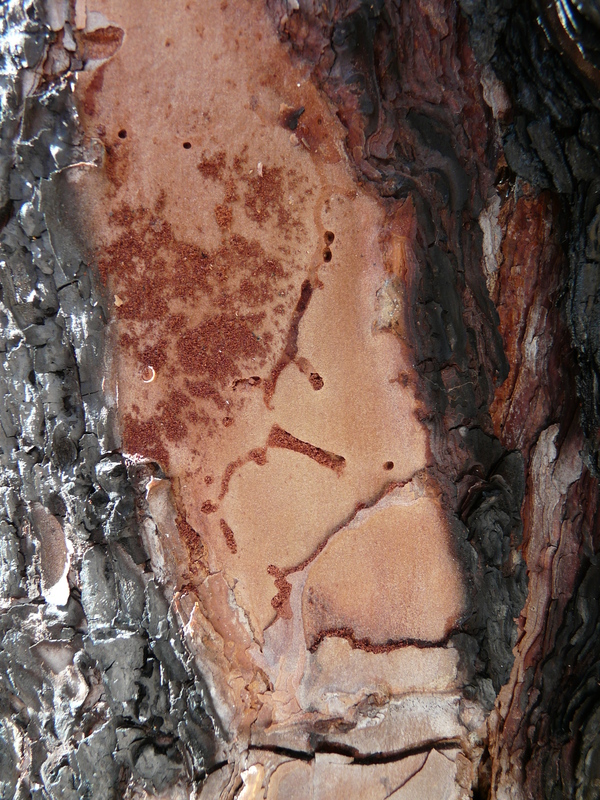 The center of the tube contains a hole through which the adult beetle enters the inner bark. If no hole is present in the pitch tube, the beetle attack was unsuccessful. An addition to the presence of pitch tubes, the adults construct egg galleries in the inner bark. These galleries are in certain shapes. Ips usually follow the wood grain, and have a “Y”- or “H”-shaped gallery patterns. I took my knife and scratched some outside bark away to find a few galleries. A common question is should we cut the trees down? Shortly after the initial attack, needles at the crown turn yellow then brown. This happens quickly. Once we notice the trees are dead, the Ips beetles have already moved out. UGA Extension Forestry Specialist Dr. David Moorhead says in a pine stand, we actually do more damage cutting down a few dead trees than if they are left alone. The only time we would cut down trees is for 1) astetic reasons or 2) they pose a risk if fallen. We can also use insecticides, but the issue is Ips attacks are difficult to predict and they enter the tree high up – you would have to cover the tree. The third beetle species is black turpentine beetles. They attack trees at the base and move about 5 feet high. However, their risk is minimal since they do no carry blue-stain fungus. 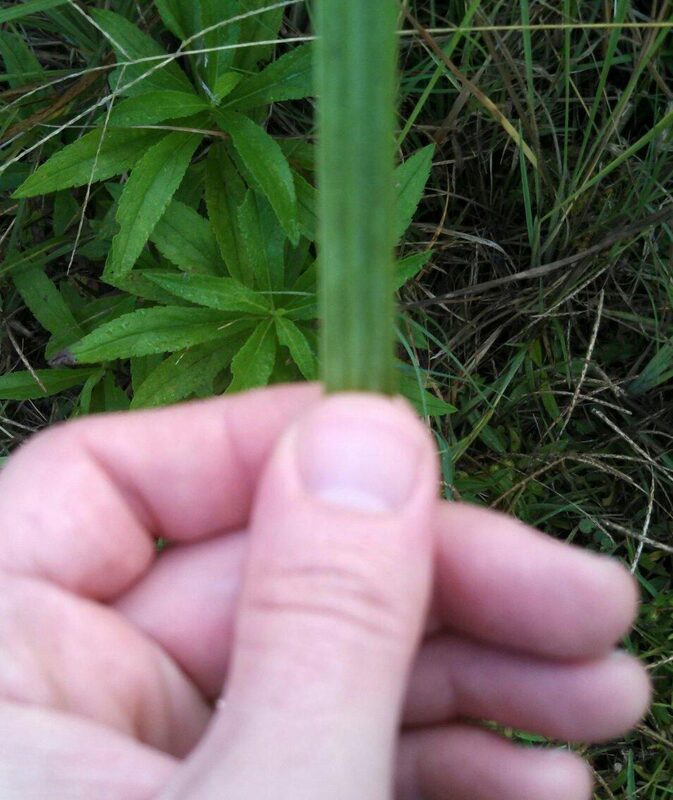 Here is a grass that looks very similar to cogongrass but is not. 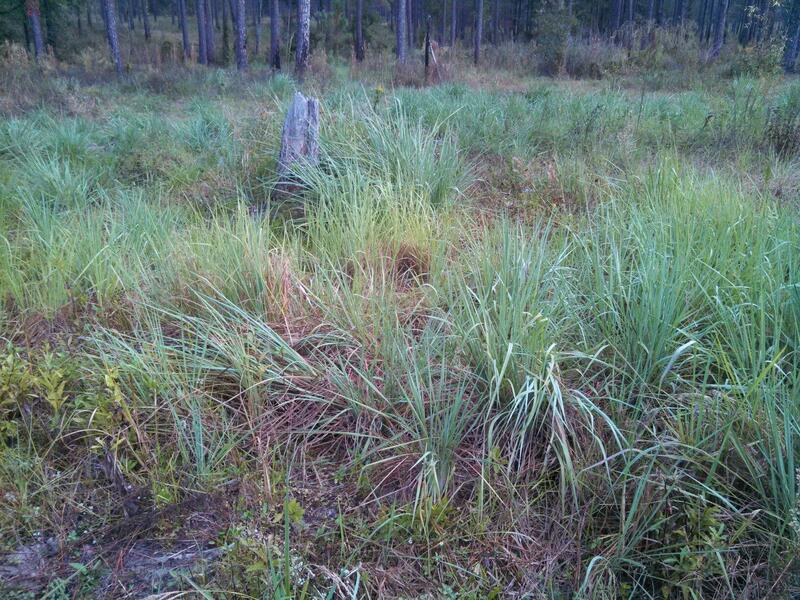 We originally looked at this exact spot in 2012 and thought it was cogongrass. 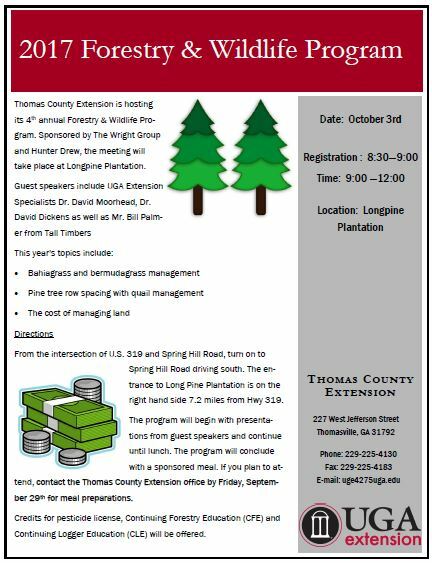 One of our cogongrass experts is Mr. Mark McClure with the Georgia Forestry Commission. 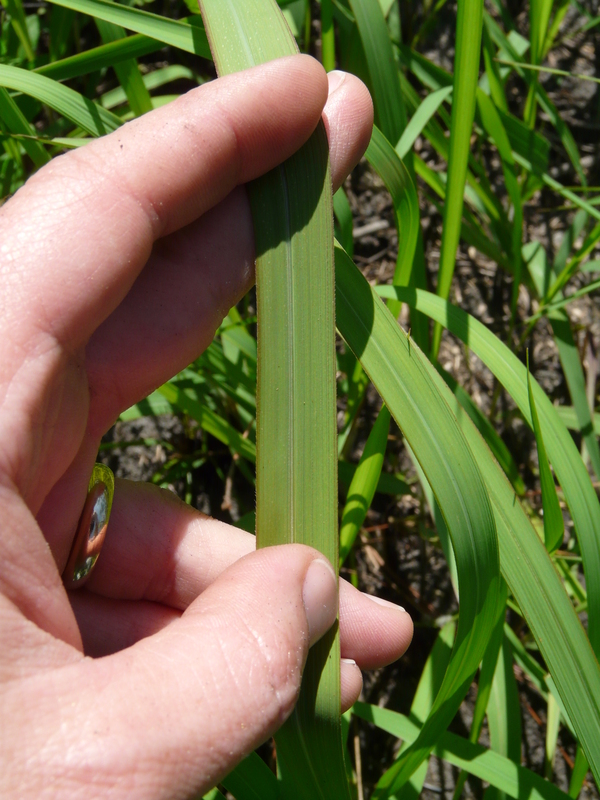 He quickly knew this was not cogongrass since the midrib IS centered, and it is a bunch-type grass WITHOUT rhizomes to spread. This is intermediate paspalum. My leaf picture is not focused, but the difference is where the midrib sets. This perennial, bunch-type grass is now moving from the planted pines across the road and causing problems for our county road maintenance. In forestry situations, the only hope is to use a 4% glyphosate, and possibly mow before seeds head. 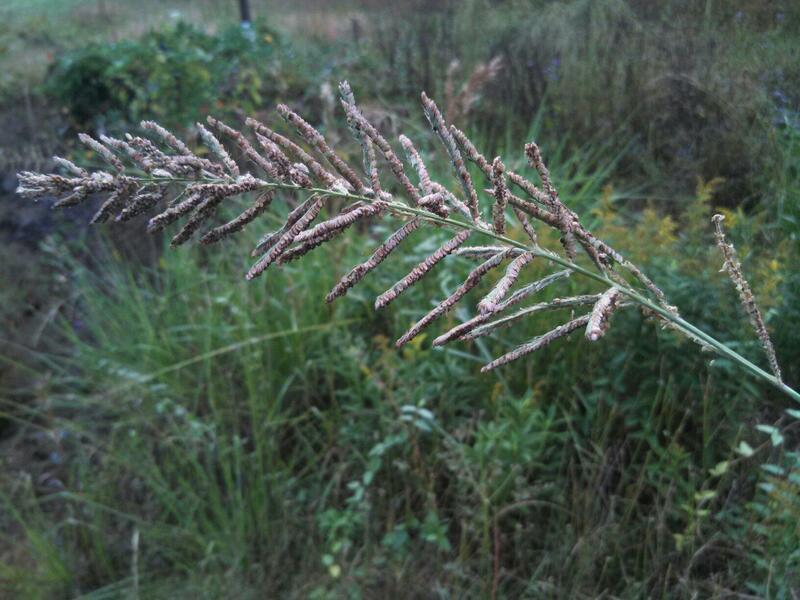 Once nighttime temperatures drop to the mid-40s, not much herbicide is translocated within the plant. We can spot spray through the growing season, and also through fall is better. 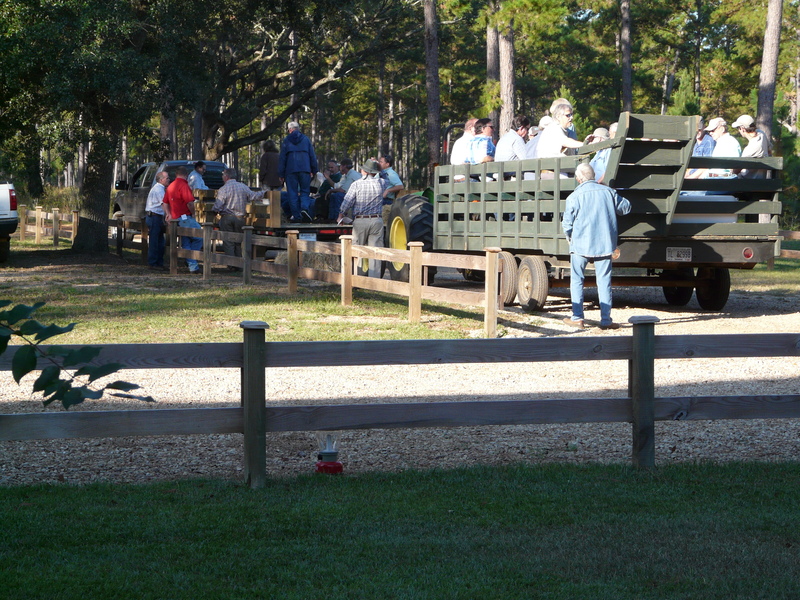 It could not have been a better day for our 3rd annual Forestry & Wildlife Program. If you were there for the first time, you would not know this program is only three years old. 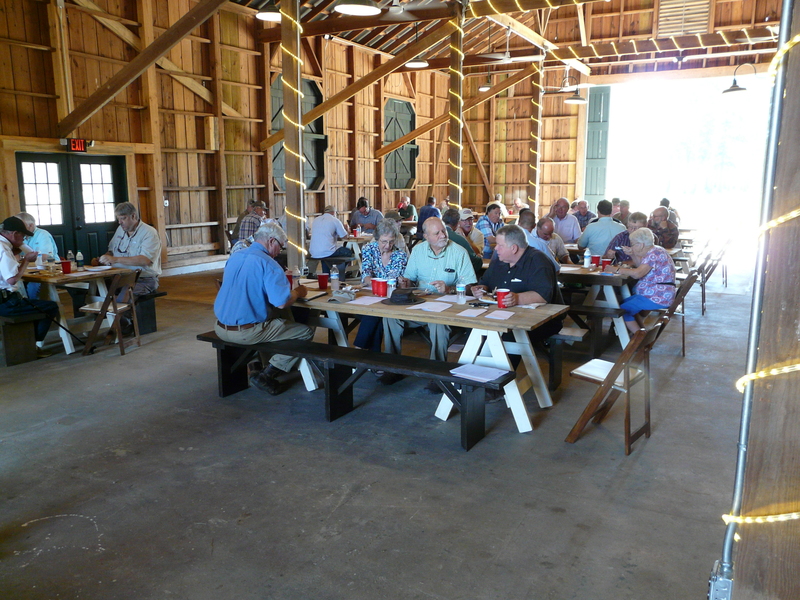 I am so indebted to everyone who works to bring this together – hay bales, trailers, tractors, barn, presenters, location and of course the food. Forester Alan Tucker sponsored this year’s meeting. 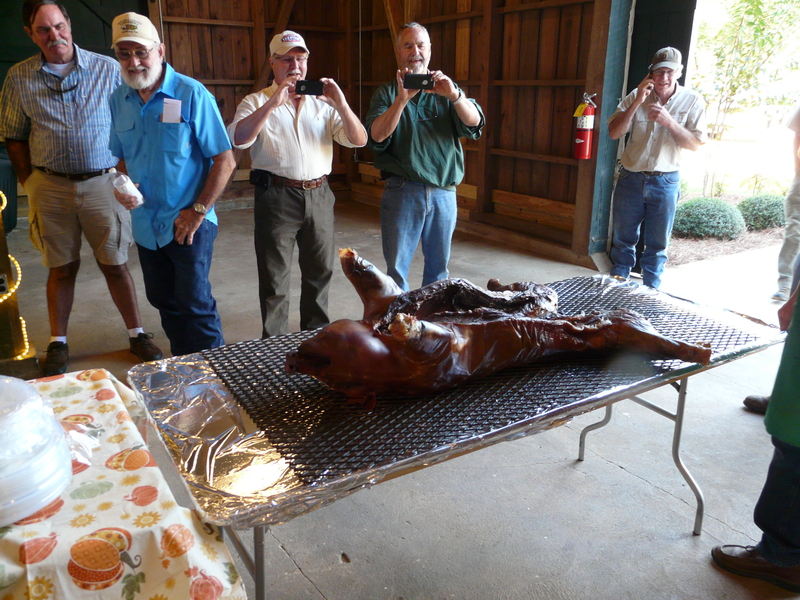 Todd Milam with the Georgia Forestry Commission, Alan Tucker, and Martin Smith stayed up all night cooking our pig. 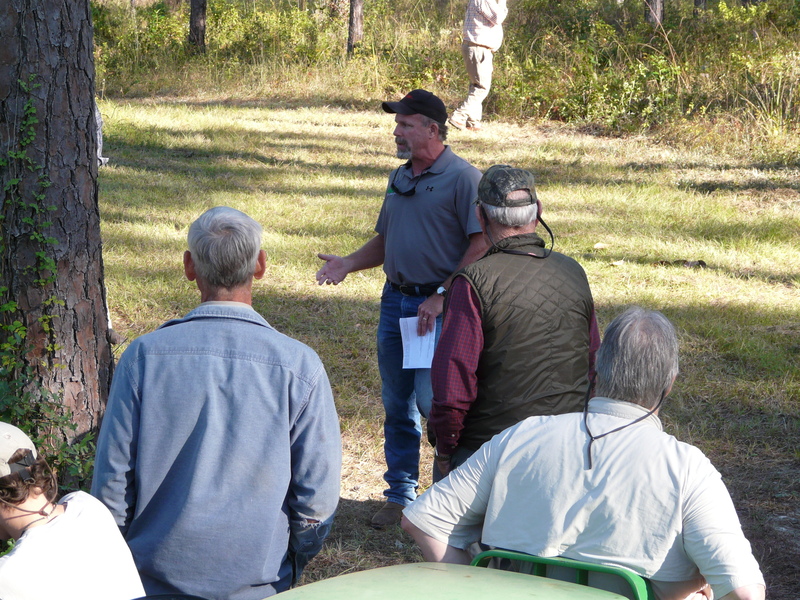 UGA Extension Specialist Dr. David Moorhead discusses storm-damaged trees on a site at Pebble Hill Plantation. Mr. Luke Harvard with USDA Wildlife Division discusses beaver management. The dam in the background has been damaged by beavers. Luke Harvard is working with Pebble Hill to help with the issue.